RCA RecordsThursday night, Usher stopped by ABC’s Jimmy Kimmel Live! to promote his new movie, Hands of Stone, but also announced that his new studio LP, Hard II Love, was available to pre-order. Now, Hard II Love not only has its release date of September 16 confirmed, but the album cover and two new tracks have been revealed. Hard II Love features 15 tracks in total. Fans can listen to the songs “Missin U” and “Champions”today, which are both also featured on the Hands of Stone film soundtrack. Usher stars in the movie, which opens today, as legendary boxer Sugar Ray Leonard. On Jimmy Kimmel Live!, Usher talked about the hard work, which included intense boxing training, for his role. “I trained for a year, boxing. And in preparation I really wanted to understand what it was to think, move and feel like a boxer,” he said. “I had to lose about 20, 25 pounds, I ate for my blood type,” he added. 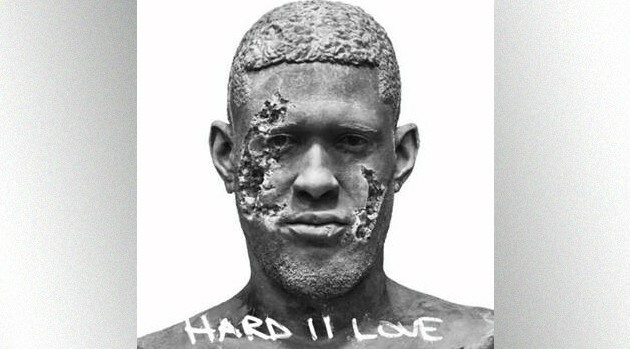 Speaking of stone, the album cover for Hard II Love shows off Usher’s face, made of the mineral matter in his likeness, with certain parts chipped away.